The University Herbarium (UC) and Jepson Herbarium (JEPS) have a current combined total of about 2,200,000 preserved specimens that are irreplaceable physical records of biodiversity. Several hundred thousand specimens have been imaged and databased and are available here. Collections of land plants include major collections from the Pacific Rim, with substantial representations from California, northern Mexico and Baja California, the southwestern deserts, and the Andes. UC/JEPS also has an outstanding collection of ferns, especially from the New World tropics. The marine algal collection is one of the best in the world and contains specimens from California, the Maritime National Parks of Alaska, Hawaii, Australia, South Africa, Antarctica, and many other regions. Fungal collections are primarily from California, northern Europe, Brazil, and Australia while mosses, liverworts, and lichens have a worldwide representation. Holdings also include voucher specimens for the UC Botanical Garden and faculty and graduate students conducting plant-related research. In addition to the collections, the Herbaria contain libraries and archives as well as modern laboratories for all types of plant and ecological studies. Use of the collections, libraries and archives is by appointment only. The mission of the University Herbarium is to understand the systematics, ecology, and evolution of all groups traditionally considered plants on a worldwide basis. Established in 1895 around a core of preserved plant specimens that were collected by William Brewer on the California Geological Survey of 1860 to 1864, the University Herbarium includes 2,100,000 specimens from land plants, algae, lichens, and fungi. With an extensive cryptogamic library and newly endowed Center for Phycological Documentation, maintenance, and care of the books and exsiccatae represent an additional aspect of the mission of the Herbarium. (1867–1946), in the Sierra Nevada, 1911. California's most eminent early botanist and founder of the Jepson Herbarium (1950). Jepson Manual, Vascular Plants of California, Second edition is available. The mission of the Jepson Herbarium is to understand and conserve the California flora through systematic, floristic, and conservation biology studies and to communicate knowledge of the flora through publications and instructional programs. Established in 1950 by a bequest from Willis Linn Jepson, the Jepson Herbarium includes over 100,000 vascular plant specimens from California. Specimen label information is available via the UC/JEPS Specimen Portal and the Consortium of California Herbaria. The Jepson eFlora is a free online resource providing the latest information on identification, taxonomy, nomenclature, distribution, ecology, relationships, and diversity of California vascular plants. 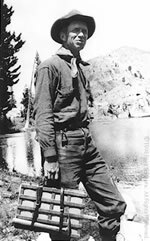 Many of our archival resources, including Willis Jepson's field books, are also available online. Additionally, the Jepson Curator maintains an active research program. He and his graduate students employ biosystematic, morphological, and molecular techniques to answer questions related to phylogeny, ecology, and evolution of plants. Educational opportunities for interested amateur and professional botanists are provided through the weekend workshop series. Through all of the programs of the Herbarium, we strive to be a liaison between the scientific community and the interested public and support conservation efforts around the state.